10:58 The party's over now. It was a beautiful day, a historical day, the great triumph of science. Now I'm going to sleep the night off, and tonight we're all gonna celebrate, drink, and make out. Thank you. 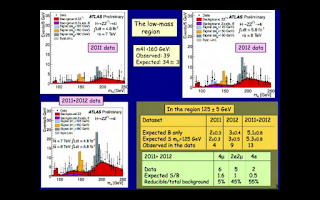 10:56 Higgs says: "I'm glad it happened in my lifetime". 10:47 I got carried away, no underwear and bras on the stage, sadly. 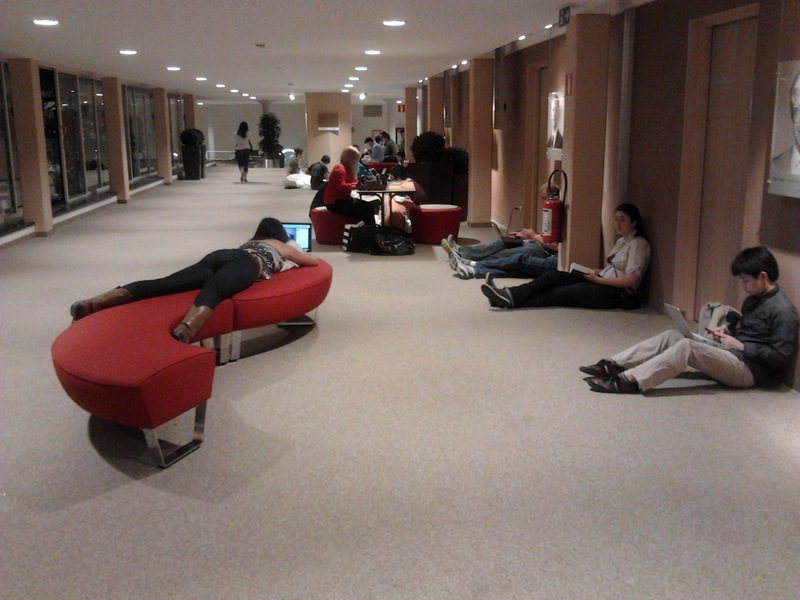 But the atmosphere in the auditorium is such that they might have been. 10:46 Standing ovations, screams and shouts, the audience throwing bras and underwear at the stage. 10:44 "I think we have it", concludes the DG. "We have a discovery of a Higgs boson, but which one"? 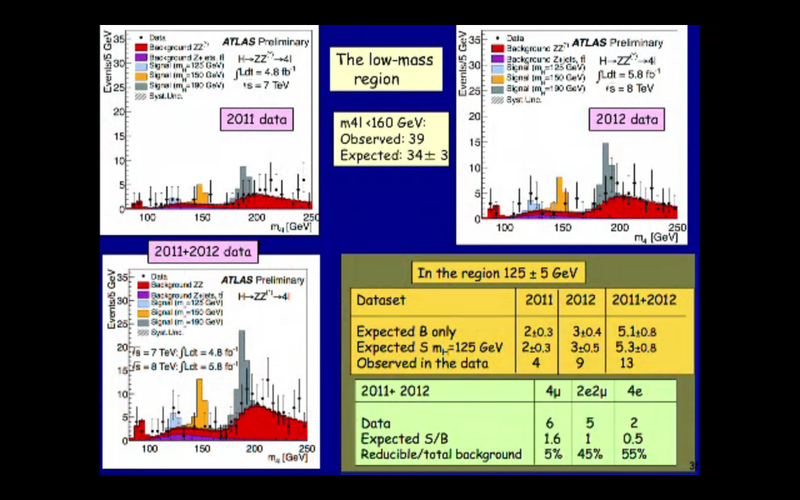 10:42 In summary, both ATLAS and CMS clearly see a Higgs boson in 2 channels: the diphoton and ZZ 4-lepton. 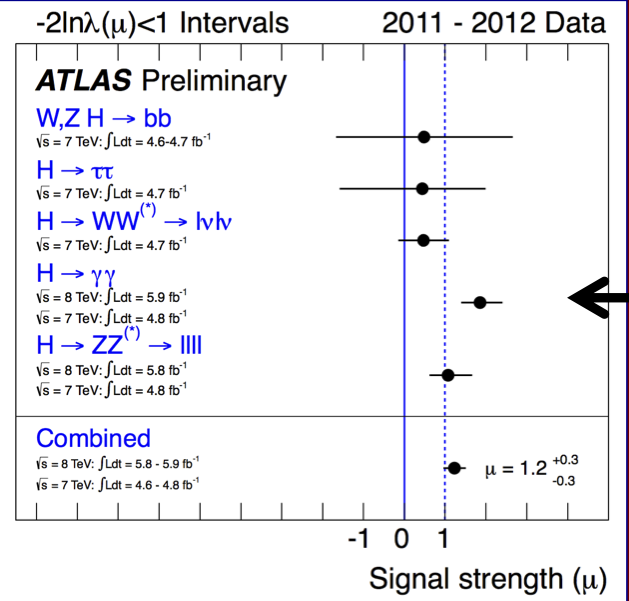 Combining those two, the significance of the Higgs signal is 5.0 sigma in both experiments. 10:40 "This is just the beginning"
10:38 The CMS and ATLAS preferred Higgs mass differ by more than 1 GeV, there will surely be questions about that. 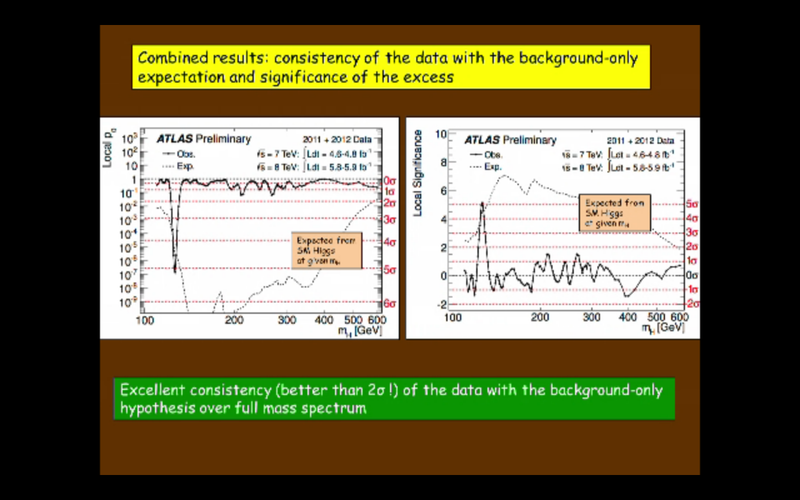 10:35 5.0 sigma combined excess with the maximum significance mh=126.5 GeV. 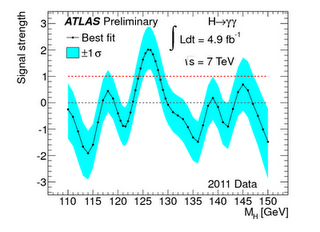 Higgs discovered by both experiments! 10:33 Going to the combination (ATLAS won't show any more channels today). 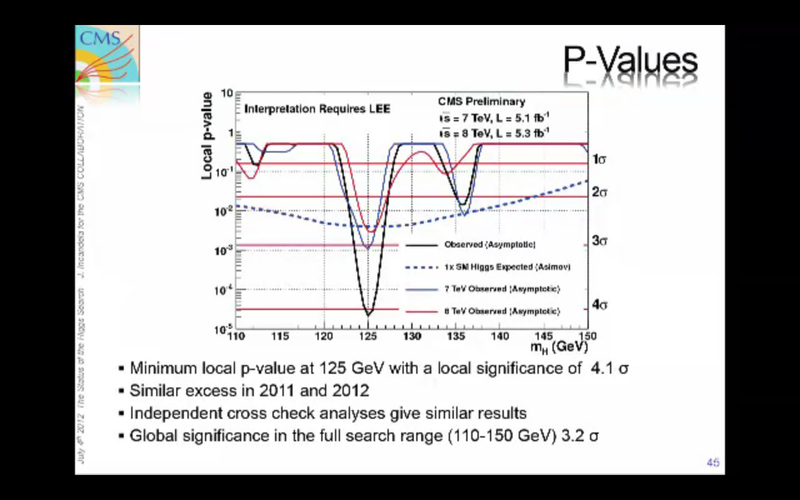 10:30 Excess near m4l=125 GeV, although by eye less beautiful peak than in CMS. 3.4 sigma excess vs 2.6 expected in the SM. 10:26 Press release is out. The discovery officially blessed. 10:22 Now the ZZ 4-lepton channel. 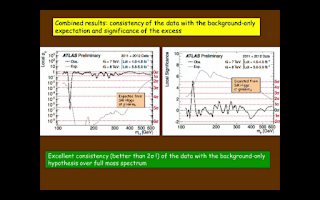 10:21 The measured rate in the diphoton channel is almost twice that predicted in the SM, with the SM rate about 1.5 sigma away. Interesting! 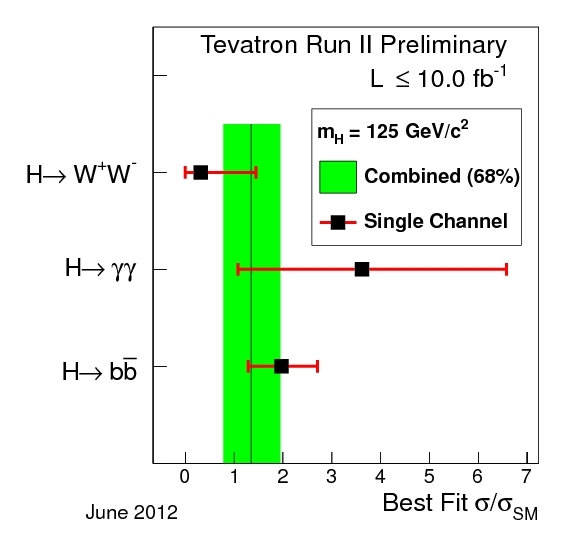 So both experiments continue to see to much signal in the Higgs diphoton channel. 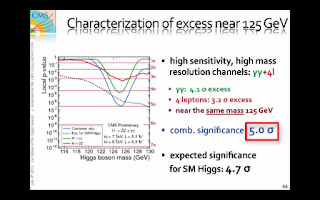 10:20 4.5 sigma excess in the Higgs diphoton channel! 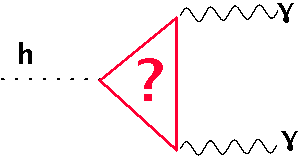 (who cares about the look elsewhere effect anymore). 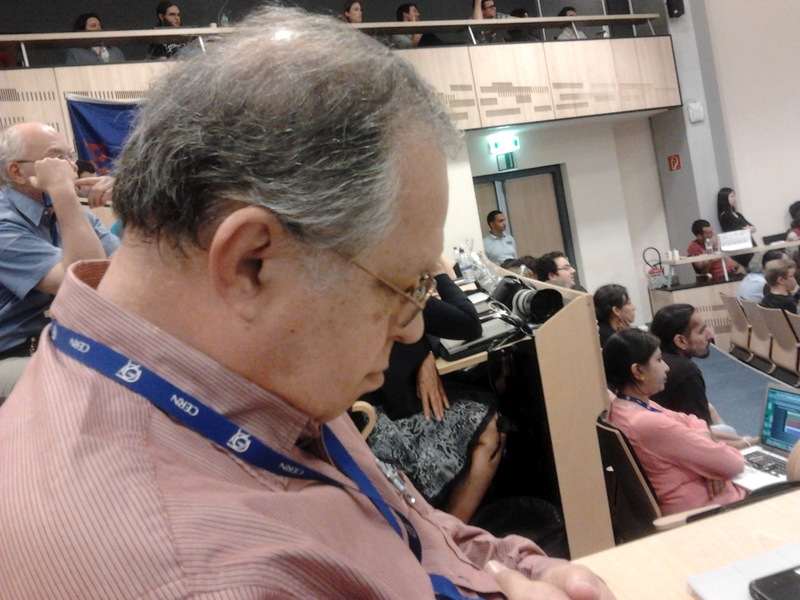 10:05 Both speakers today felt compelled to devote the first 15min to irrelevant bla-bla. Probably because the main subject doesn't appear that exciting. 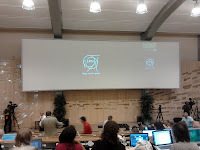 9:53 Fabiola Gianotti on the stage. Time for ATLAS. 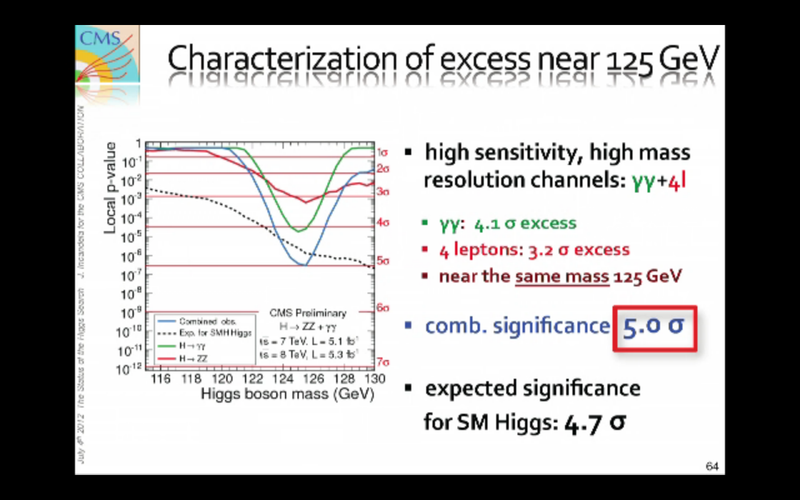 9:50 In summary, CMS observes a Higgs boson with mass 125.3±0.6 GeV at 4.9 sigma significance. 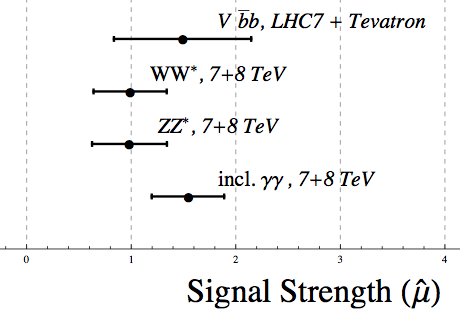 Some funny glitches in the data (a slightly too large diphoton signal, no excess in the di-tau channel) but overall good consistency with the Standard Model predictions. 9:47 All channels combined, 4.9 sigma significance, vs 5.9 expected. 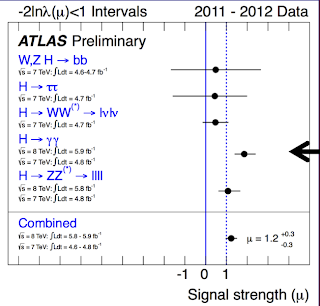 9:41 Some excess, but not signifcant, also observed in the WW dilepton channel, and b-bbar associated with W/Z. No excess at all in the tau-tau channel, although there should be. 9:34 Beautiful peak in the 4-lepton channel. Higgs observed with 3.2 sigma significance in this channel, vs 3.5 sigma expected in the SM. 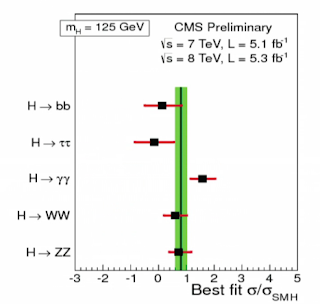 9:31 CMS sees a Higgs in the diphoton channel with the rate about 50% larger than predicted by the Standard Model (but barely one sigma above the SM). 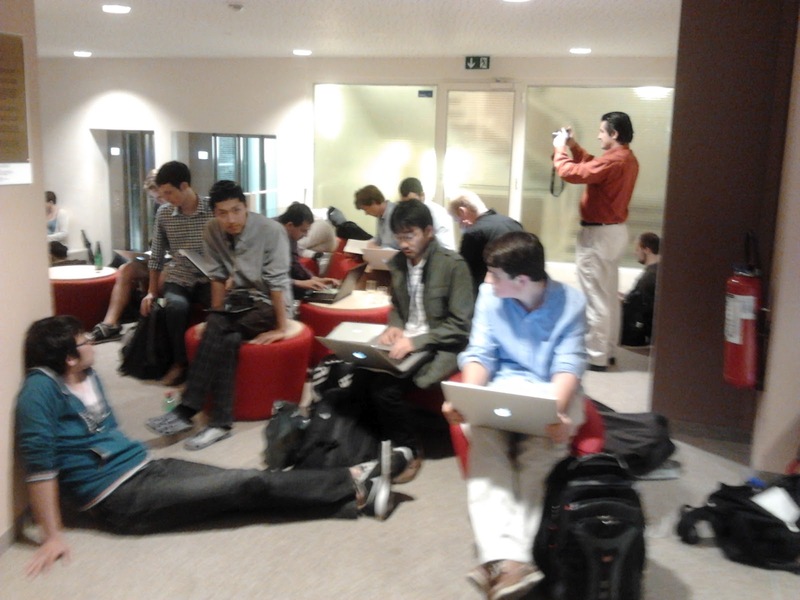 9:22 Finally, Higgs to diphotons. 9:18 It's not that I stopped blogging, it's that Joe is boring. We want the meat! 9:11 5.2 inverse femtobarn of 2012 data, 5.6 in the muon channel. 9:04 Joe Incandela on the stage, the CMS talk start. 9:02 C'est parti! "Today is a special day" says DG. 8:56 Yes! Higgs is here!!! Everything ready for the discovery. 8:50 10 minutes to the seminar. Still no Higgs. 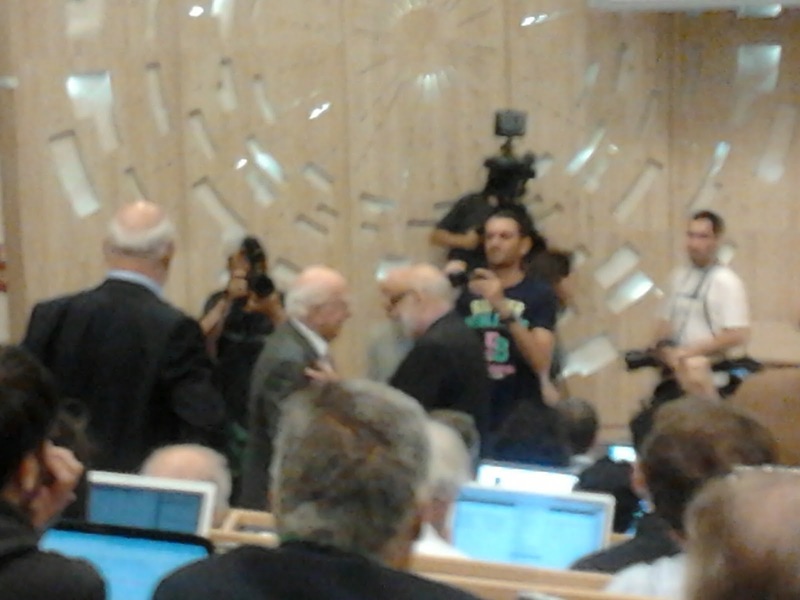 But the other Nobel prize winner this year is already inside. 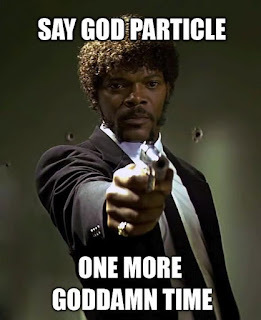 8:43 By the way, if you come across a press article today about the god particle that's a perfect gauge the author is an idiot and has no idea what he's talking about. 8:38 The audience is a funny mix. 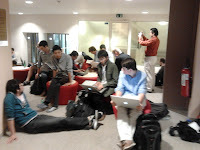 One half are 60+ big shots who could get themselves a sit reservation, the other half are 20-something Higgs groupies who had a strength to queue all night. 8:25 The title of the seminar is Higgs Search Update. Reminds me of A Model of Leptons. 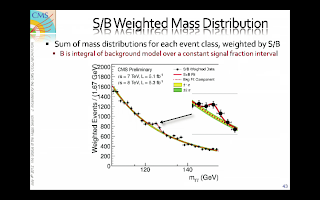 8:15 The first accurate prediction of the Higgs mass was formulated in this video. It has gone unnoticed, however, because Jim Morrison was stoned and reading it backwards. 8:05 There's a still a wild crowd in front of the auditorium, looks like Walmart on Black Friday... hope there will be no riot today. 7:35 The door are open, people flowing in, but miraculously no stampede. 7:25 People have been have been camping all night in front of the auditorium door to get inside and see the discovery live. These are pictures from 3am last night. 7:20 This is the day. 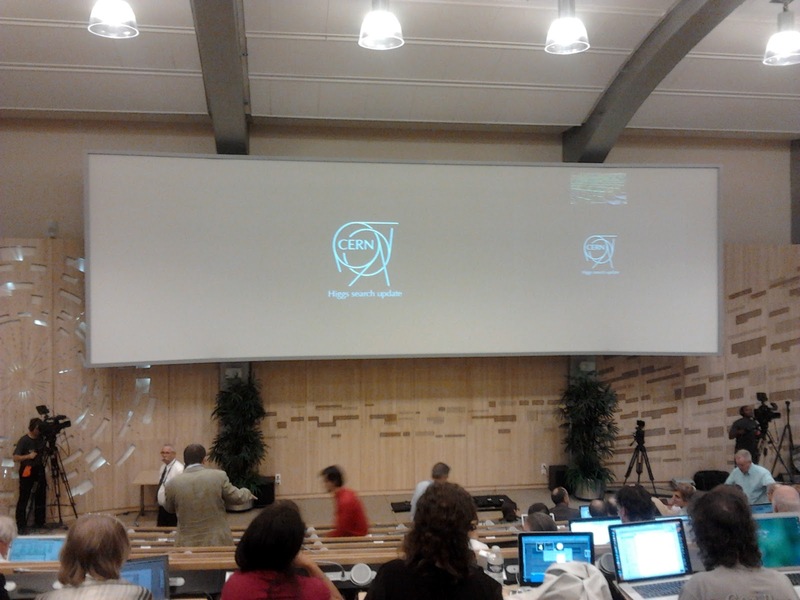 The most important day for particle physics in this century, and probably ever.